File:Energy-ball.jpg The first spell of the Dark Wizard, it compresses his power into a small sphere to be unleashed on his target. File:Fire-ball.jpg Even novice Dark Wizards can master this simple technique easily. By shooting a huge tongue of fire, it gives a massive damage to enemies. File:Power-wave.jpg It shoots a wave of force towards the enemy. Power Wave digs under the ground and moves toward the enemy to deal moderate damage. File:Lightning.jpg Lightning spell that can knock enemies back. File:Teleport.jpg The Teleport spell allows the caster to relocate himself anywhere within the screen. They use can use the spell to evade attacks or use it to position for a better attack. File:Meteor.jpg This spell summons a meteorite from the heavens to smite opponents. File:Ice21.jpg The Ice spell has a chance of chilling enemies, slowing down their movement and the speed of their attack. File:Poison.jpg The Poison spell conjures poisonous vines that sprout from the ground near target's feet that may slow and poison the target. Poisoned enemies will slowly lose life over time until the poison wears off or is cured. File:Flame.jpg The Flame spell summons a pillar of flame which causes continuous damage on all creatures it touches. File:Twister.jpg The Twister spell allows the caster to conjure small cyclones that can confuse the enemy when they are struck by it. File:Evil-spirit.jpg This spell summons spirits to fight on the side of the Sorcerer. This damages all opponents within the sorcerer's line of sight. File:Hell-fire.jpg Wizards can conjure hellfire that springs up from the ground and hits multiple targets around him. File:Aqua-beam.jpg This spell conjures a beam of concentrated elemental water that penetrates through multiple opponents. File:Comet-fall.jpg The Cometfall spell conjures a bolt of energy that shoots targets from the sky. File:Inferno.jpg Inferno spell creates a ring of fire around the caster for a few seconds, instantly burning those who come too close to the wizard. File:Teleport-ally.jpg Teleport Ally enables the wizard to summon a member of his party to his location. It is very useful in situations where party members get caught in tight spots. File:Soul-barrier.jpg The Soul Barrier spell encases the caster in a sphere of energy which absorbs a certain amount of damage dependent on energy. 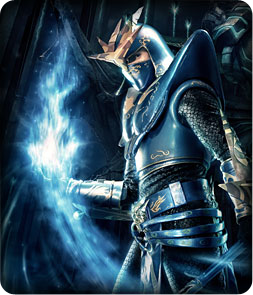 File:Ice-storm.jpg The Ice Storm spell conjures massive shards of ice to fall on enemies and slow down any survivors. File:Decay.jpg Causes falling poison balls which deal a huge amount of damage and can effectively "poison" the enemy to death. File:Nova.jpg Probably the most powerful spell in the game. The Wizard concentrates all his power and generates a huge explosion of arcane energy. File:Wizardry-enhance.jpg A buff that enhances a wizard's minimum wizardry damage by 20%. This page was last edited on 22 May 2013, at 23:08.